The north campus of the University of Delhi was tense on February 22 with violence breaking out inside the Ramjas College campus, outside the college, and later in the evening in front of the Maurice Nagar police station. 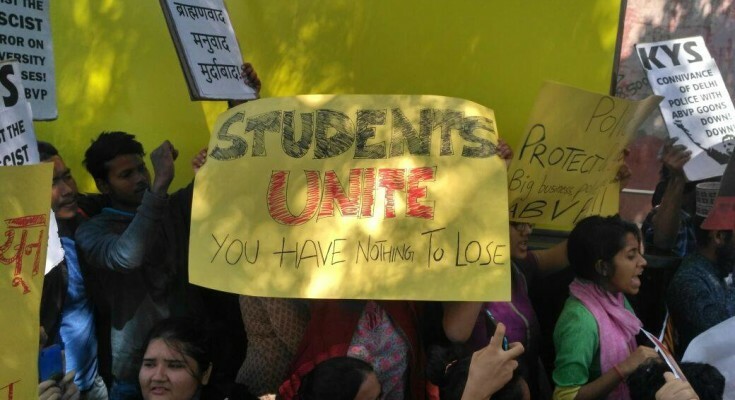 After the violent intervention by the ABVP of an academic conference in Ramjas College on February 21, a common students and teachers protest was set to take place the next day, on February 22, against the intervention. 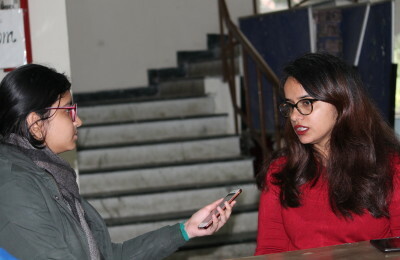 ABVP’s reason for obstructing the conference was the presence of Umar Khalid and Shehla Rashid, JNU students, who were amongst the speakers at the conference. Umar Khalid was arrested on sedition charges in 2016, however no charge sheet has been filed in the case yet. The common students teachers march was scheduled to start at 1 p.m. but was blocked by he ABVP. Before the march, as an extra security measure, guards at Ramjas College checked ID cards to ensure that only students of the college were allowed to enter. What was supposed to be a peaceful march around the campus was cut off by the ABVP as they began shouting slogans like “Bharat Maata ki jai” and ” Vande Mataram” in the sutta lane within the Ramjas College campus. In response, the student and teacher protestors sat down and began their own chants of “Hum honge kaamyaab ek din” on a lawn adjacent to the ABVP gathering. 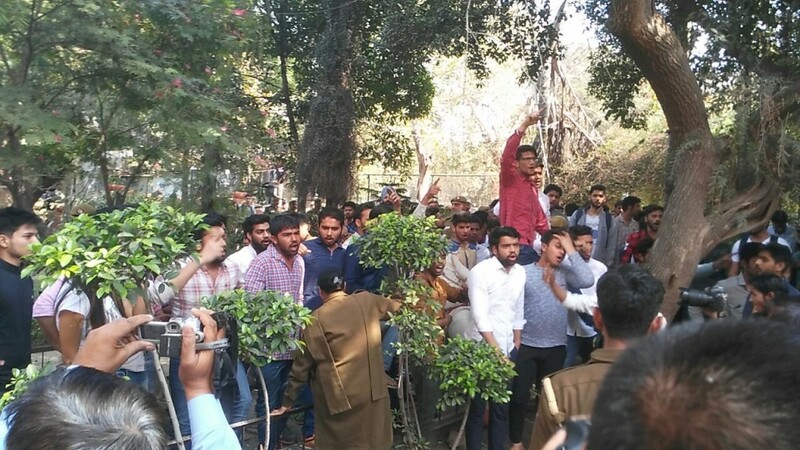 Within a few minutes of this standoff, members of ABVP were seen entering into the lawn space where the students were gathered. There are eyewitness accounts and videos floating on social media of the ABVP activists beating, shoving, and grabbing the students gathered. The police intervened immediately and the students shifted towards the canteen premises. A large gathering of students sat down in front of the canteen and under the conference hall. Reports came in of a large number of protesters consisting of students, teachers and activists gathered outside the college gates. Students and teachers who were inside the college sat down in silent protest. The police tried to form a barrier between the two groups. The ABVP activists repeatedly tried to break the barrier and attack the students. Fearing escalating violence, the police escorted the students out through the back gate where they were transported to the metro station in Civil Lines. Meanwhile, outside the college, students and teachers who had congregated for the protest march, and journalists covering the issue, encountered ABVP activists. There are videos and evidence of students and faculty members being injured during this encounter. Around this time, roads leading to the Maurice Nagar police station were blocked by the police and shopkeepers around Patel Chest area were asked to bring down their shutters. The protest reached the Maurice Nagar police station area after 3 p.m., where police had been deployed to keep the violence from escalating and forming a barrier between the two sides. The protesters placed themselves outside the police station, demanding that an FIR be lodged against the violence committed by the ABVP. Slogans like “Aar ho ya paar ho, aaj FIR ho” were heard from the protesters’ sides. At around 6.30 p.m., just after protesters were speaking to the police about their demands, a commotion broke out as the police surrounding the protesters started absconding them, in some cases with unnecessary force. The protesters were rounded up in police buses and taken to different corners of the city in an attempt to break up the protest on campus. They were dropped off later in the evening. There were reports and rumours of a potential ‘witch-hunt’ by ABVP members around the campus in search of people at the protests. No such incidents were confirmed. Another peaceful protest was organised today by the students and teachers at the Delhi Police Headquarters in ITO with heavy police presence around the area. Hundreds of students attended the protest, where sloganeering was heard and protest signs could be seen condemning the police brutality against student protesters yesterday. An exit gate at the ITO metro station was closed around noon. The protesters pushed for an FIR to be lodged and for a meeting with the police officials. After meeting with the students, who wanted separate FIRs to be lodged against the ABVP members who engaged in violence, the police informed them that separate FIRs cannot be lodged and they would need to be clubbed under one FIR. The student protesters then took the decision to have affected students write down testimonies of violence committed against them, with which they’ll approach other authorities given the contention between their demands and the police’s stance. The police has admitted to the use of excessive force against students on February 22nd. The case related to the entire incident has been transferred to the Crime Branch. They also invited students to submit their complaints to the police which can then be clubbed together. The student protesters are reportedly upset about the incident being branded an ABVP-AISA clash and the protesters being clubbed together as AISA members. 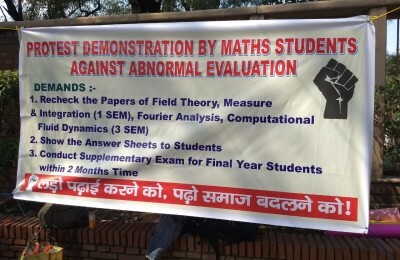 They have called these protests movements by the students and teachers of Delhi University, and not a political party. The protesters comprised of students from across Delhi University, Jawaharlal Nehru University, and other institutions across Delhi, with supporters of various movements and parties, and many with no political affiliations. There were other protests in North Campus as well, with NSUI carrying out their peace march from the Arts Faculty to the Maurice Nagar police station, and the ABVP continuing their stance of protesting against ‘anti-national’ activities and elements. There were reports of considerable police presence around the campus. 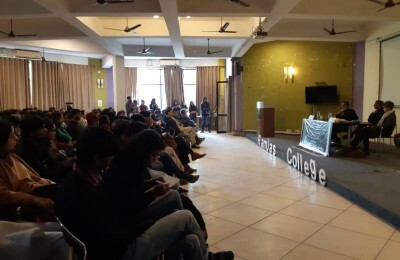 Previous PostStreet play event postponed at SGTB Khalsa on police recommendation Next PostFinance and Investment Cell, Hansraj College organises Empresa 2017.